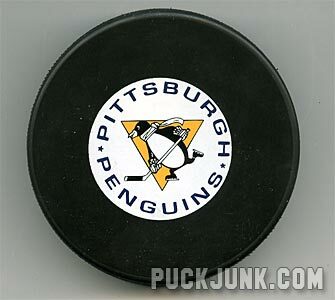 I am not really a collector of pucks, even though you think I was, considering that this blog is called Puck Junk. 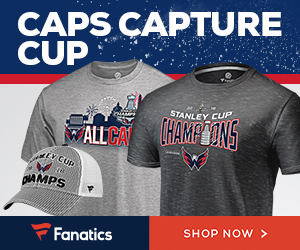 Pucks are an iconic and necessary part of hockey. 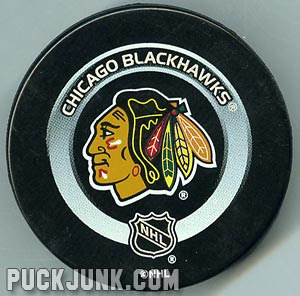 But pucks are also hard to collect. They are heavy and take up a lot of space. 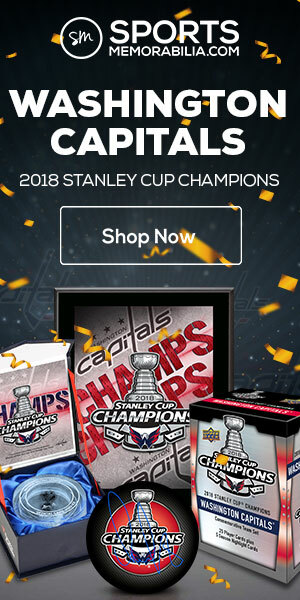 Numerous pucks are made each season — not just counting one for each team, but all the commemorative, outdoor games, all-star game and other “one-offs.” And really old, or really unique pucks can go for hundreds of dollars. 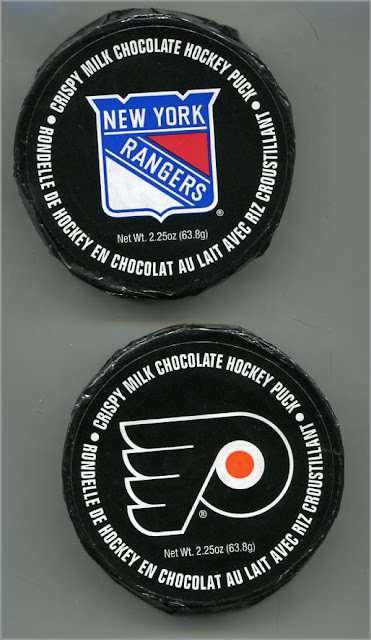 So I usually steer clear of pucks and stick to cards, which I enjoy so much more anyway. 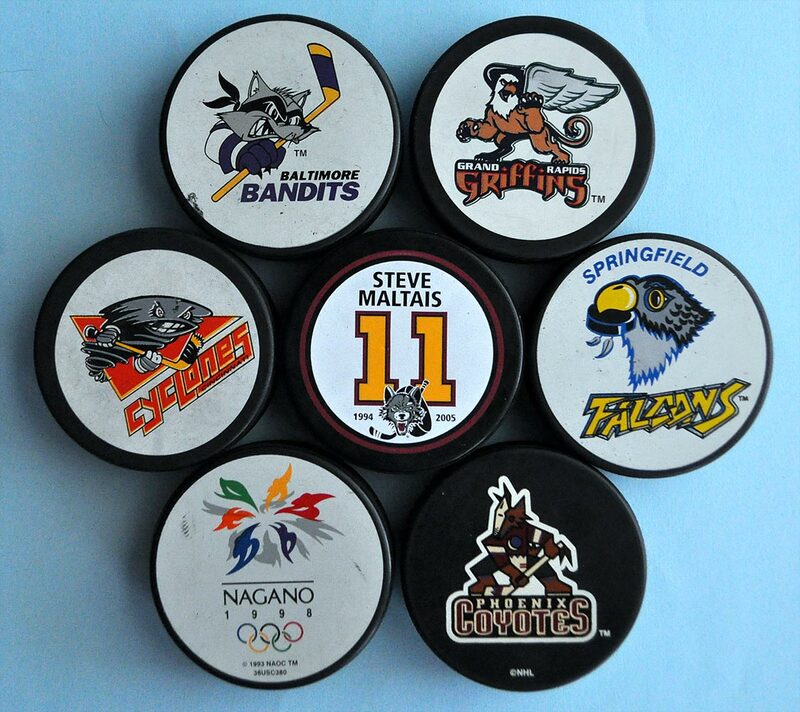 However, I recently gave in and added a few pucks to my hockey collection. 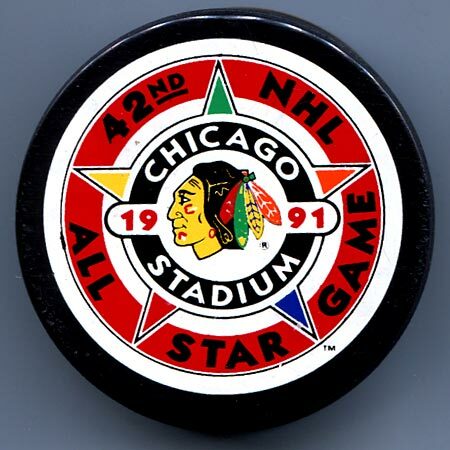 This hockey puck is a small–yet important–piece of memorabilia from my 1991 All-Star Game collection. 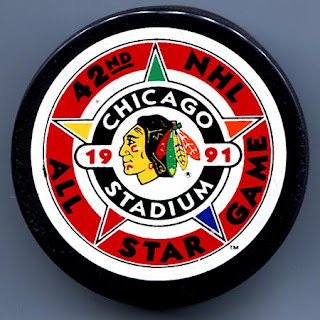 The front shows the All-Star Game logo. Correct me if I’m wrong, but I believe the saying goes “One man’s puck is another man’s junk.” At least, that was the case yesterday, when my girlfriend Shellie and I investigated a few boxes of discarded books in the alley. You usually don’t find anything good when people throw books away–just romance novels and The Da Vinci Code. I, on the other hand scored a hat trick and found two pucks and a hockey book amongst the otherwise mundane collection of travel guides and cook books. I picked it up not too long ago at a card show. I love the old “Penguin with a scarf” logo. This particular cartoon Penguin looks a little fatter than the one that was used later. The scarf adds both style and motion to the design. I’ve always found these two things hilarious–in both a good and bad way. I mean, the logo is kind of cartoony and foppish…but I guess that’s why I like it. It’s fun, and doesn’t take itself too seriously (aren’t we all tired of the “snarling animal” as a sports mascott?). I hear that question all the time. Fact is I don’t really know and I figure that arriving at a total is not something I hopefully will ever be burdened with. I will concede that I do know the value of most things and can ballpark estimate the rest. It’s important to remember values change with time too. 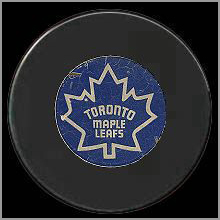 Author Thom RacinePosted on March 10, 2008 October 7, 2016 Categories Pucks3 Comments on What the Puck?